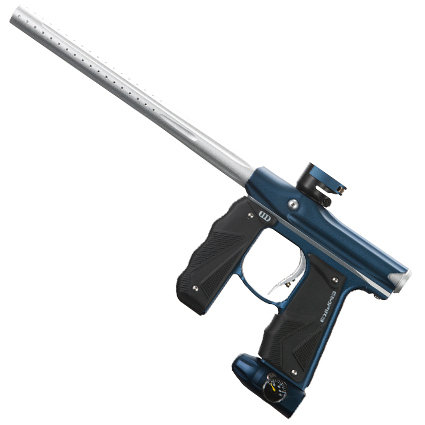 The Empire Mini™ GS is the next generation of a paintball marker legend. The team at Empire has taken the proven Mini marker platform and designed and developed it to be even better. In addition to the battle proven Mini engine the GS includes a full wrap-around rubber foregrip that creates a secure grip and protection from paint and the elements. The Mini GS also adds an On/Off ASA that eliminates any thread issues and makes for smooth removal of your tank. For an added bonus, the new design allows for a simple drop-in of the Redline OLED board in without switching the foregrip. The ASA and Foregrip attachment points have been beefed up for extra strength and superior performance. Of course you have all the regular goodies you have come to expect and depend on from the Empire Mini: Hose-less design, Eyes, Clamping Feedneck, and proven Mini performance. It takes a truly amazing product to follow a legend, and Empire hits the mark with the Mini GS.